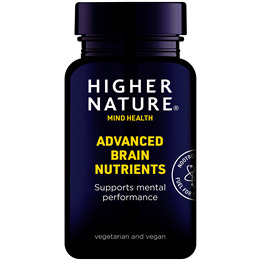 Higher Nature Brain Nutrients provides a unique blend of vitamins, phospholipids and amino acids for sharp focus. Choline is essential for normal brain and nervous system development and function. It is a building block for the brain messenger acetylcholine and helps maintain memory and support cognitive function. It is a vital part of nerve cells and supports normal nerve impulse transmission. Phosphatidyl Serine supports memory and brain performance. With vitamins B3, B5 & B12 to support mental performance. Also contains vitamin B5 which contributes to the normal synthesis and metabolism of some neurotransmitters. A complete formulation to support a healthy functioning brain. Take alongside Advanced Nutrition Complex and DMAE. Contains non-flushing Niacin (Vitamin B3). Vital component of nerve cells. An Advanced Nutrition Complex multivitamin is also recommended alongside consumption of Higher Nature Brain Nutrients. Choline bitartrate (anti-caking agent: silicon dioxide); vegetarian capsule: hypromellose (carrageenan*); calcium d -pantothenate, l-arginine pyroglutamate, acetyl l-carnitine HCL, phosphatidyl serine-rich lecithin (from soya) (anti-caking agent: silicon dioxide); anti-caking agent: silicon dioxide; flow agent: vegetarian magnesium stearate; niacin (as nicotinamide), folic acid, methylcobalamin. Adults: Take 2 vegicaps once or twice a day, with meals. Children over 8 years: Take 1 vegicap a day, with meals. Not advisable in cases of manic depression or epilepsy. Below are reviews of Higher Nature Brain Nutrients - 180 Vegicaps by bodykind customers. If you have tried this product we'd love to hear what you think so please leave a review. 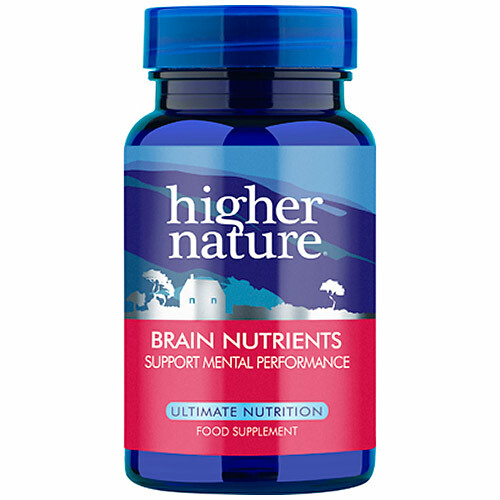 Higher Nature Brain Nutrients provides key vitamins, phospholipids and amino acids to optimise the function of the brain neurotransmitter, acetylcholine, for healthy concentration, memory and learning.